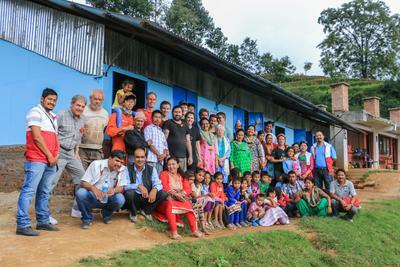 Projects Abroad launched a Disaster Relief Project in Nepal in June 2015, following the devastating earthquakes that hit the country in April and May of that year. In just 20 months after the project started, volunteers from around the world reached the goals set out by Projects Abroad: to rebuild classrooms for children affected by the earthquakes. Volunteers built 96 classrooms at nine schools in Nepal, and more than 2000 children are able to go back to school because of these efforts. The first wave of Projects Abroad volunteers hit the ground running in June 2015 and joined a team of engineers, architects and local staff to begin the rebuilding. 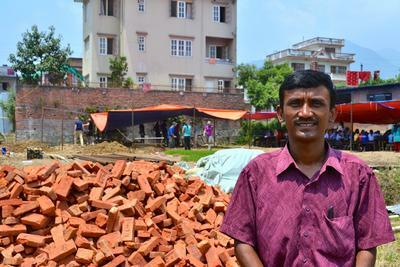 “I worked for a month building a school for the locals in Lalitpur, Kathmandu. The work consisted of digging foundation trenches for the school, mixing and laying cement and concrete, and then laying the bricks,” said volunteer Takudzwa Chipamaunga. Since the project launched, more than 500 Projects Abroad volunteers from Europe, North America, Africa, Australia, New Zealand and Asia joined the rebuilding efforts in Nepal. With the immediate needs of the community met and the goals of the Disaster Relief Project reached, the project has now been closed. A Building Project has been now been opened in Nepal to continue the work that was started in June 2015. The project will address the ongoing need for classrooms and schools in the country, which still faces challenges rebuilding after the earthquakes. For Mr. Surendra and the 205 children at Sunrise School, lessons can finally continue under the strong and safe infrastructure built by volunteers and locals. “I felt so grateful to all Projects Abroad volunteers for helping out our school during such a difficult time. I also don’t have a word to thank them. I have seen them working so hard in the heat and rain to complete the school. I will always be grateful for all the volunteers of Projects Abroad,” he said. Find out how you can contribute to our Nepal General Building Project or take a look at our final Disaster Relief Report .